Two years after knocking off an incumbent in the Republican primary, state Rep. Tony Tinderholt, R-Arlington, is fighting off his own challenger who argues Tinderholt is out of the mainstream. 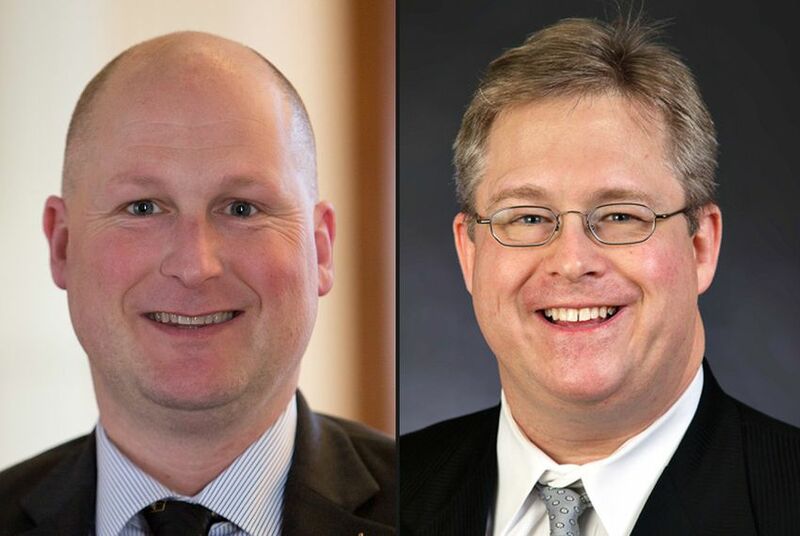 Incumbent Tony Tinderholt (l.) and opponent Andrew Piel are vying for the HD 94 seat in Arlington in the March 1 GOP primary. No Democrat is running. Extending the statute of limitations for lawsuits against accused child molesters is the kind of idea that usually sails through the Texas Legislature. But last year state Rep. Tony Tinderholt, R-Arlington, joined a tiny but vocal minority of Republicans voting against a bill with that aim. He said he objected to specifics of the proposal and was willing to place his principles over politics. Now, he has drawn a Republican primary challenger who is arguing that Tinderholt’s views are too extreme. That opponent, attorney Andrew Piel, has made Tinderholt’s vote on House Bill 189 a key campaign issue. “That kind of legislative negligence has to stop,” Piel said. This year, the establishment is trying to strike back. And in no race is that more clear than in Tinderholt’s House District 94. Piel boasts endorsements from two former Arlington mayors and the current president of the Arlington school board. He also has the backing of multiple former state representatives and senators, including the last public endorsement of former state Sen. Chris Harris, who died in December. Tinderholt, meanwhile, has the backing of conservative activists inside and outside the district. In the past month, he has received substantial donations from Tim Dunn of Midland, a financier of conservative activist group Empower Texans, and from the campaign funds of State Rep. Matt Krause, and state Sen. Konni Burton, both Fort Worth Republicans. That has helped give Tinderholt a significant cash advantage. At the end of last month, he had just over $100,000 cash in his campaign account. Piel had slightly under $28,000. The disparity is part of why Tinderholt remains confident that he'll prevail. "I did exactly what I told voters I would do, and I did it respectfully," he said. Tinderholt proudly boasts of his strict conservatism. His campaign website and Facebook page declare in big bold font that he is the “#3 most conservative in the Texas House.” That is based on a ranking by Rice University political scientist Mark P. Jones. “I gained that record by fighting to secure the border, bringing fiscal accountability and defending innocent life,” Tinderholt said. And Tinderholt has rebuked Piel’s criticism of his vote on House Bill 189, calling it “disgusting.” He said he supported the overarching idea of the bill and voted for an earlier version. But he argued last month that the final version would only really apply to accusers who didn't have DNA evidence supporting their cases. Previous state law had no statute of limitations for cases in which DNA is available, he said. “This creates a high risk of someone wrongfully accused being unable to defend themselves from accusations 30 or 40 years after the occurrence based on witness testimony alone,” Tinderholt said in a statement he posted on his website. But Piel sees it differently. He said the bill, which has since become law, is a sign of Tinderholt being more interested in voting with far-right conservatives than in the interests of his district. He notes that Tinderholt has strong support from Empower Texans and almost always aligns with its views. Last year, Empower Texans gave Tinderholt a 100 rating on its “Fiscal Responsibility Index.” And in 2014, the group spoke out against a $660 million bond package for Arlington ISD, which Piel publicly supported. The money was badly needed, Piel said, and the bond passed with more than 70 percent of the vote. “The people in this district have the right to be represented by someone who votes for them, and doesn’t take orders from people outside the district,” Piel said. But Piel faces an uphill battle, said Allan Saxe, a political science professor at the University of Texas at Arlington. Tinderholt has worked hard in the past two years to establish himself in the community, Saxe said. Piel is hoping that support from longtime Arlington leaders will carry him to victory. A certain segment of Republicans in the district have never gotten over Tinderholt’s defeat of incumbent Diane Patrick in 2014. And they are bothered by Tinderholt’s sometimes aggressive conservatism. But Tinderholt made no apologies. Disclosure: The University of Texas at Arlington is a corporate sponsors of The Texas Tribune. A complete list of Tribune donors and sponsors can be viewed here. Correction: A previous version of this story incorrectly stated that state Rep. Molly White, R-Belton, voted against House Bill 189. She voted in favor of the bill.